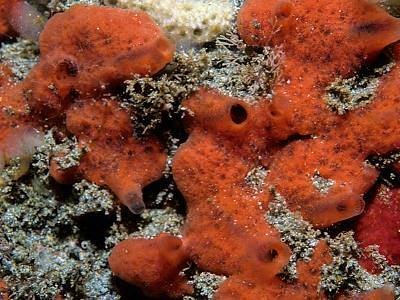 Description: This species is a conspicuous bright red encrusting to cushion shaped sponge, sometimes with smooth, irregular lobes. The surface is very distinctive, it consists of a closely packed series of dots that can be seen under close examination by the naked eye or using slight magnification, it is porous, with dark spaces under the surface membrane. 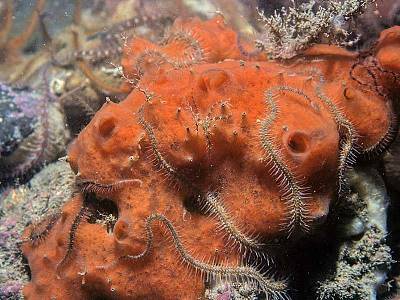 Habitat: This sponge is found on vertical rock faces in sheltered and also very exposed sublittoral sites. It is also occurs on boulders and rock in sheltered areas with moderate to strong tidal streams. Distribution: This species is widely distributed and common in the British Isles. Similar Species: The characteristic surface, once seen, is very distinctive. 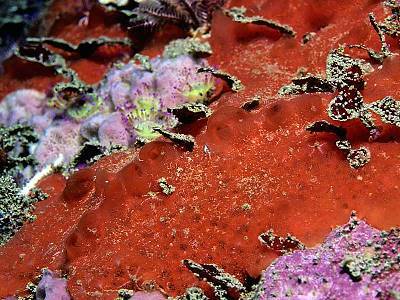 There is potential confusion with many other red encrusting species but these are usually much thinner. Picton, B.E. & Morrow, C.C. (2016). Mycale rotalis (Bowerbank, 1874). [In] Encyclopedia of Marine Life of Britain and Ireland.